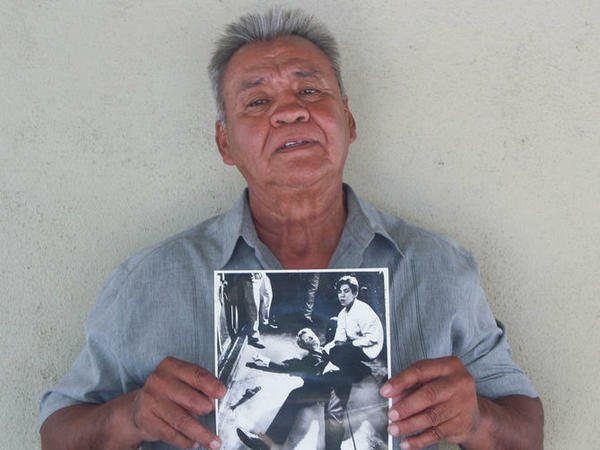 Juan Romero earlier this year at his home in Modesto, Calif., holding a photo of himself and Sen. Robert F. Kennedy, taken by The Los Angeles Times' Boris Yaro on June 5, 1968. Romero died this week at age 68. Romero died on Monday at age 68. A friend, Rigo Chacon, told the Los Angeles Times that Romero had died following a heart attack he suffered a few days earlier. Romero spoke to StoryCorps earlier this year and recounted the events of that night — a night that would haunt him for decades. "I kneeled down to him and I could see his lips moving, so I put my ear next to his lips and I heard him say, 'Is everybody OK?' I said, 'Yes, everybody's OK.' I put my hand between the cold concrete and his head just to make him comfortable." "I could feel a steady stream of blood coming through my fingers," Romero said. "I remember I had a rosary in my shirt pocket and I took it out, thinking that he would need it a lot more than me. I wrapped it around his right hand and then they wheeled him away." 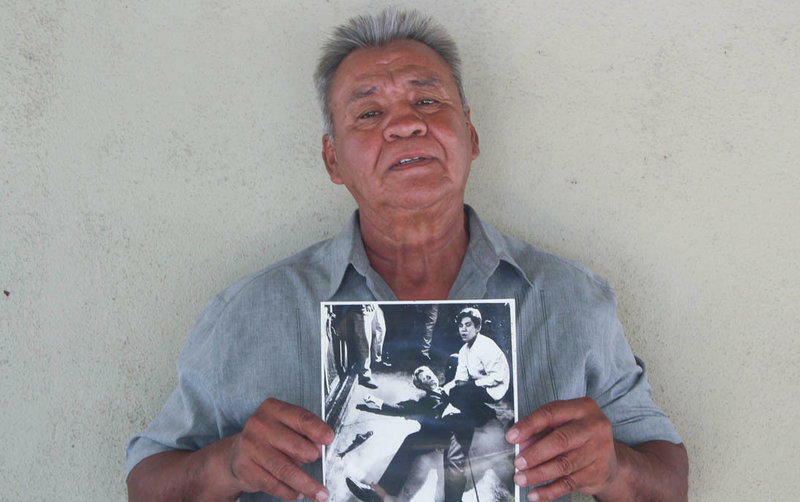 The photo of that moment — light illuminating the fallen senator's face, the young man crouched at his side — locked Romero into the public memory of RFK's assassination. And it left him with an uncomfortable legacy. Letters addressed to "the busboy" began arriving at the Ambassador Hotel — including a couple of angry ones. "One of them even went as far as to say that 'If he hadn't stopped to shake your hand, the senator would have been alive,' so I should be ashamed of myself for being so selfish," he told StoryCorps. He said it had been "a long 50 years." Los Angeles Times columnist Steve Lopez met with Romero a number of times over the years. Romero lived near San Jose and worked paving roads and driveways. Romero told Lopez that that he wasn't perfect, but had tried to work hard and live according to the values that Kennedy had advocated. "Maybe I don't have the tools to become a politician and change the laws," Romero said. "But maybe I can help everyone understand there were people who tried to correct injustice." He told Lopez in 2015 that after many years of trying not to look at the photos of that night, he was finally able to face them once more. "I saw a person in need," he wrote to Lopez, "and another person trying to help him." Romero traveled to Arlington National Cemetery in 2010 to visit Kennedy's grave. "I felt like I needed to ask Kennedy to forgive me for not being able to stop those bullets from harming him," he told StoryCorps. He bought his first-ever suit before the visit. "When I wore the suit and I stood in front of his grave, I felt a little bit like that first day that I met him. I felt important. I felt American. And I felt good." StoryCorps producer Jud Esty-Kendall contributed to this report.